Yes, you can use the Insta360 Air (hands-on impressions here) on a smartphone enclosed in a smartphone case without having to remove the case. Here’s how. The Insta360 Air is a 360 camera accessory for Android smartphones. It plugs into your phone’s Micro USB port (or USB Type C port), allowing you to use your smartphone screen to preview the shot and change settings. 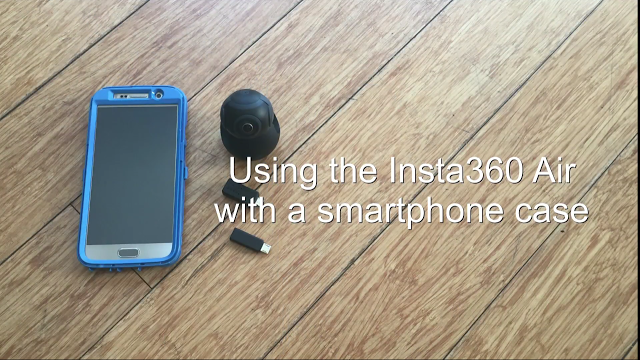 It also enables you to share your 360 photos and videos easily, using your phone. To summarize, yes you can use Insta360 Air on a smartphone with a case. To do so, you’ll need an extender (Micro USB or USB Type C, as the case may be). Not all extenders are compatible. The one I found that is compatible is by YCS. With many smartphone cases, however, the YCS extender will probably not fit straight-out-of-the-box. Instead, you have to trim the Air (I used a nail file). Depending on your case, you may have to trim different parts of the YCS extender. Once the YCS extender is trimmed, you should be able to connect the Insta360 Air to your smartphone without removing its case. I tested the Insta360 Air and YCS extender on a Samsung S6 with an Otterbox Defender and it worked. Please note I don’t have any other Android phone to test, so there’s no guarantee it will work with your phone and/or your case. Please also note this is not officially endorsed by Insta360 so if it does not work, please don’t complain to them about it. Thank you for your understanding!